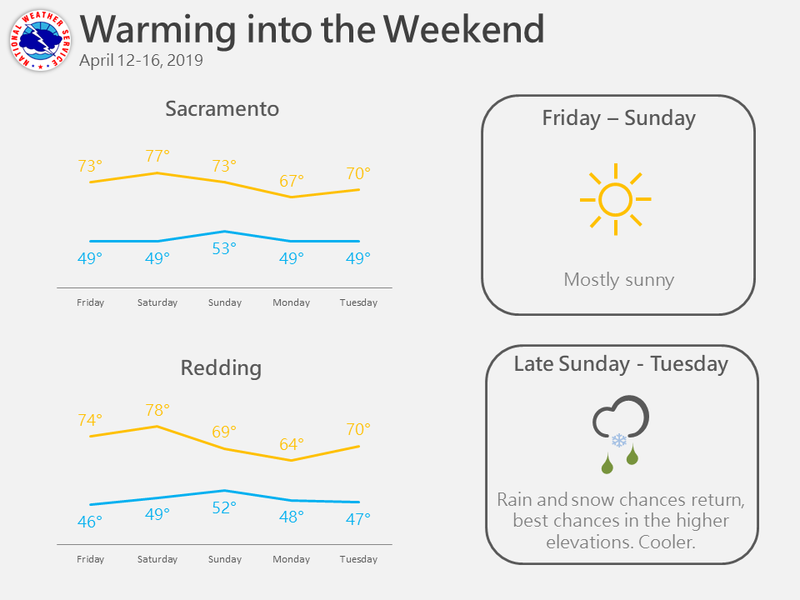 April 12, 2019 – Dry weather with a gradual warming trend through Saturday. Mountain precipitation spreads in Sunday, becoming widespread by Monday with light to moderate snow accumulations above 5500 feet. Drier and warmer conditions return by the middle of next week. Dry and mild weather is expected today as eastern Pacific ridging builds into the area. 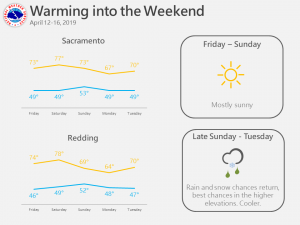 A gradual warming trend is expected for the end of the week with mid to upper 70s across the valley; near 80 over the northern San Joaquin Valley on Saturday. These forecast highs range from 2 to 8 degrees above normal. Breezy northerly winds continue, and could briefly gust up 30-35 mph this afternoon. Light showers are possible as a weak disturbance drops southward into the northern mountains Saturday night, extending into the northern Sacramento Valley and northern Sierra on Sunday. Light snow accumulations are possible above 6500 feet. QPF amounts will remain light; 0.25 to 0.5 inches (locally higher) over the mountains. Temperatures will be close to average for this time of year. Monday through Monday night has been trending somewhat wetter as a shortwave trough from the Gulf of Alaska passes through. Several inches of snow are possible above 5500 feet, heaviest Monday evening. 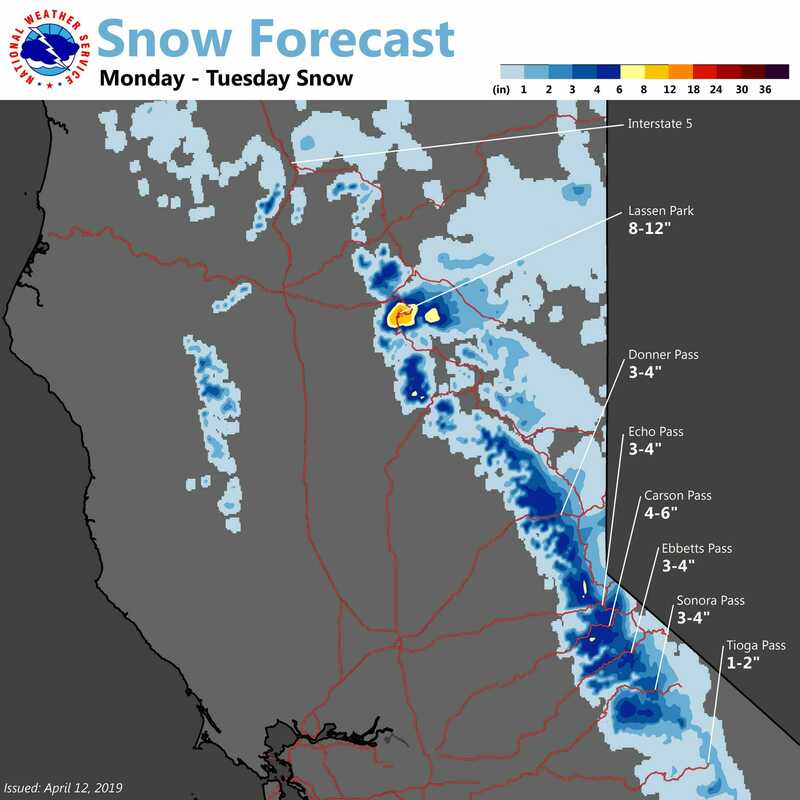 This could cause travel issues over Sierra passes. We will be watching to see if current trends continue. Extended forecast starts out Tuesday with a trough of low pressure moving into the Great Basin. Shortwaves dropping down the back side of this trough could bring a few light showers to the northern mountains and Sierra Cascade range but impacts should be minimal considering low precipitation amounts expected. Upper ridging building in over the eastern Pacific will bring a quick end to any shower threat Tuesday night and will start out an extended dry period lasting through the end of the week. As the upper ridge amplifies and starts to move inland on Wednesday, daytime highs shoot up to over 10 degrees above normal for this time of year. Still more warming is expected on Thursday as the ridge axis centers over the west coast. Maximum temperatures on Thursday will reach into the 80s across the Sacramento and northern San Joaquin valleys. Fair skies and warm temperatures continue on Friday but Friday night may start to see a transition in the dry weather pattern with models showing some sort of Pacific low pushing over the state next weekend.